Andy wakes one morning to find an alien pod on his front lawn. Mom’s roses are ruined. The aliens are here to collect—using a Vaporizer—all the water found on Earth, including that of humans, who are more than 60% water. These creatures travel the universe harvesting water from planets without significant life. The “Big Heads,” who bark the orders, make a decision: humans are not significant. Large tripod machines crush homes and businesses with grabbers capable of sweeping up people and holding them in a cage, until it is time to vaporize them for their watery bodies. Andy gets away and rescues Charlie from her ruined home and then his best friend Hector. They avoid the large, bulky “Thugs,” who bully the worker aliens until they obey the Big Heads’ commands, and the crushing arms of the grabbers. Andy befriends a worker alien by the name of Been’Tok. Been’Tok, Andy, Hector, Charlie, and Andy’s dad plan to shut down the vaporizer, free the hostages, and send the aliens back to where they came from. But can an eight-year-old boy, recently recovered from bouts of leukemia treatment, save his world? Inspired by War of the Worlds by H. G. Wells, Andy McBean and the War of the Worlds actually brings the aliens to Earth. The action is fast. Andy and his friends are easy to like and fun to watch as they travel by foot. The story is believable, though Andy has several lucky escapes from the aliens (great fun!). Been’Tok is a cute, three-eyed monster with a heart and soul. He loves collecting the odd artifacts he finds while vaporizing various planets for the water his planet desperately needs. He disagrees with his commander, believing humans are significant, especially after Andy saves his life. The cuteness of Andy McBean and the War of the Worlds reminded me of E. T., even though the two are different types of stories. Until the end, it is not clear whether Been’Tok wants to return home. He enjoys the company of Andy and his friends. The communication barriers make for some delightful scenes as Been’Tok tries to learn Andy’s language. World leaders and military might around the world meeting Been’Tok is funny. Unfortunately, there are several typos throughout the book, but I could actually ignore them—a first—thanks to the intense story that held my interest (though that does not excuse the sloppy editing). Black and white illustrations enhance the story. Middle grade kids, especially boys, will love the world Kutzera created. The three-tiered aliens can be humorous and dangerous at the same time. Readers will find several surprises along the way and a happy conclusion. Andy is a terrific character from his loyalty to his best friend Hector, his desire to impress Charlie—the new girl at school—and his valiant attempts to move past his illness, despite his parents’ fears and coddling. Will Andy McBean have future adventures? * If he does, I hope Been’Tok finds a way to join him. ANDY MCBEAN AND THE WAR OF THE WORLDS. Text copyright © 2014 by Dale Kutzera. Illustrations copyright © 2014 by Joemel Requeza. Reproduced by permission of the publisher, Salmon Bay Books, Seattle, WA. Purchase Andy McBean and the War of the Worlds at Amazon —B&N—Smashwords. 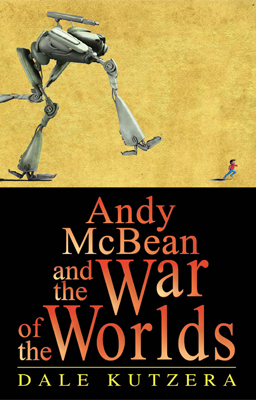 Learn more about Andy McBean and the War of the Worlds HERE. I think these aliens have been visiting here on the West Coast. That could explain the drought. ;) Great review, Sue! I’m sure sci-fi fans will love this story, let alone the three eyed, Been’Tok. I know you shouldn’t judge a book by its cover, but I was totally sold by that book’s cover. The illustrations get better and the story is well-worth the time.